Day -4: Today I took the older girls to visit our old neighbor. It was so nice for the kids to see each other again and run around outside. So many memories from last year came flooding back. 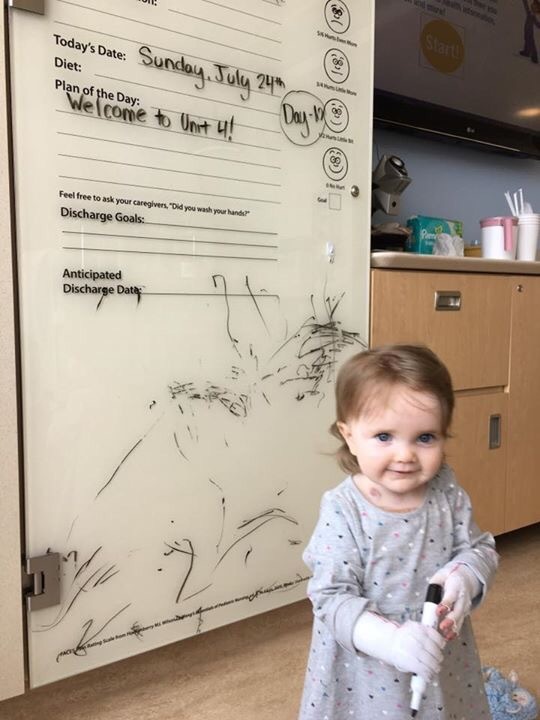 When I got to the hospital, Kiira was in a great mood, although she threw up once this morning. She took a long nap after her bath and bandages and then she and I played all over the room, as I followed behind with her IV pole. Her favorite spots are the window sill to look at the elephant on the playground below and the closet. She even attempted to feed her baby while leaning over from the closet. We read books, sang songs, and played with her new toys. Since she only had one of her chemo drugs today, tonight she doesn’t have to get diapers changed every 2 hours, so hopefully she will sleep more soundly. I said a prayer with her tonight before bed and then asked her to say one. She said “Dear God, Amen!” So simple, but so sweet. I love knowing that God hears her calling him and I pray He heals this precious child. Day -5: Things continue to go well. Kiira is loving the new toys and I’m so thankful for them, because I brought almost nothing here for her. The fun gifts really help while she is stuck in a small room for 24 hours a day, hooked up to IV lines. Today we continued with 2 chemo drugs and dealt with a few falls in the crib. I can’t remember when the sickness will hit, but we enjoy these days of energy, so many hugs and kisses from her, and laughing hysterically about the silliest things. This girl is so full of joy–I love it! Jason and the girls return home August 6th, so I just have one week left with them. It will be hard on both of us, but we both have a lot of support, which helps immensely. We are swapping nights with Kiira for now, so we see each other for a couple hours a day at the hospital while we give her a bath and do bandages. Then we swap kids/homes for the night. It’s only temporary though, and I love having some time with the other girls before they go home. We appreciate your continued prayers! 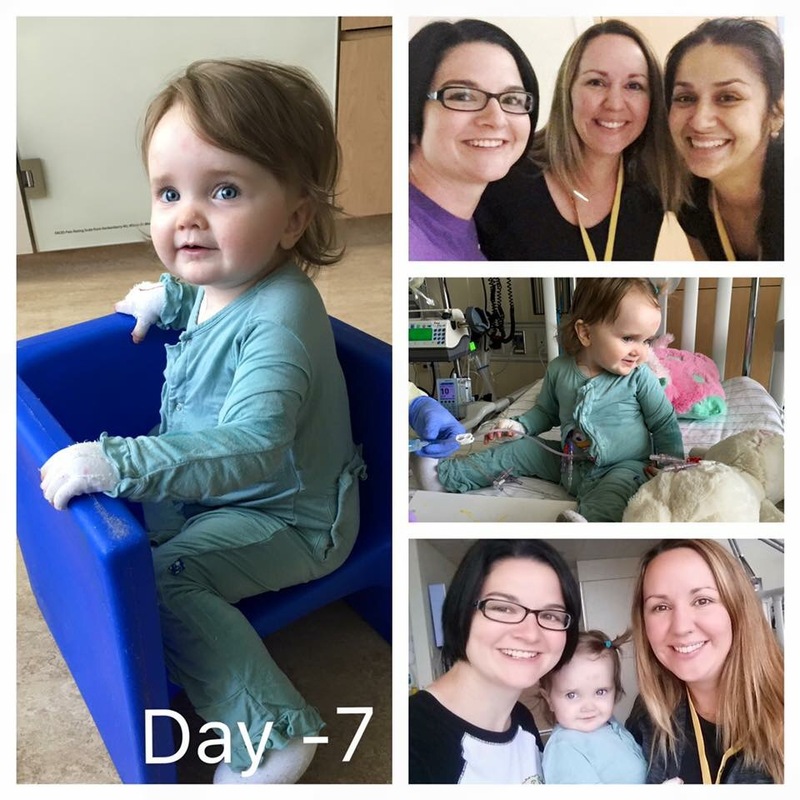 Day -6: Aside from Kiira’s frustration with being hooked up to her lines all day and required diaper changes every 2 hours, you wouldn’t even know Kiira was on chemo yet. 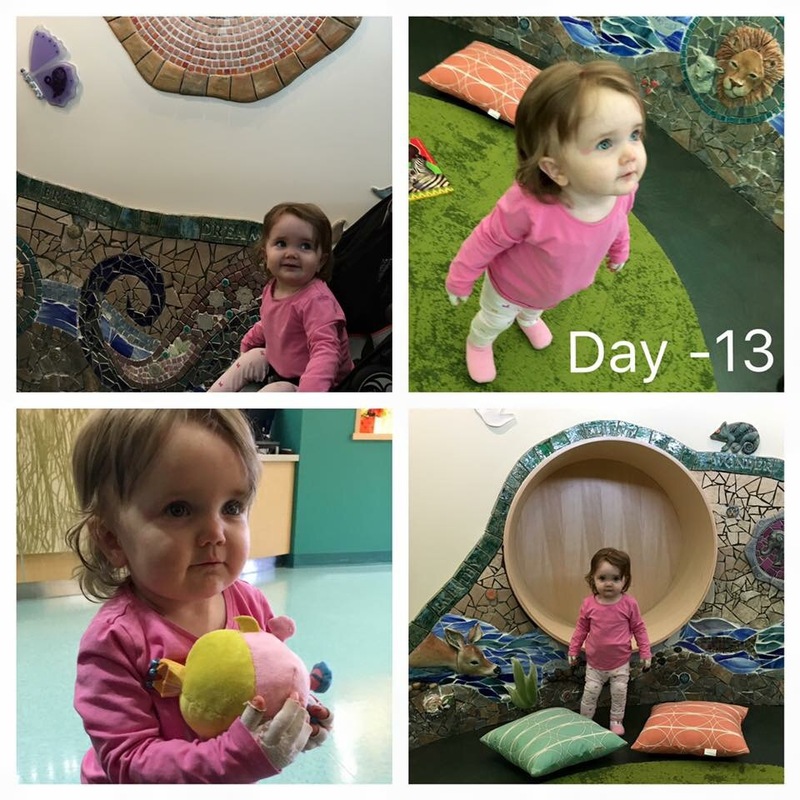 She started her doses of 2 new chemo drugs today, but typically the effects take awhile to kick in, so I enjoyed watching her play with a ton of energy. Today music therapy came in to relax her for a nap after her bath and bandage change, but she was so intrigued by the guitar and wanted to play it too. Kiira is also enjoying her new doll and bear, so thank you for those! I haven’t been home today, but heard a ton of stuff came in her for her. Thank you so much for showering her and my other daughters with gifts! Day -7: Today went great! Kiira woke in a good mood and she had no fevers today. In fact, she was still full of energy and asking for veggie straws and gloves, 2 hours past bed time. Last night I was able to chat with a couple of EB moms and today a dear friend we met last year during transplant (Help Anton’s mom, Vanessa), came to see Kiira. I loved catching up with her and Kiira had to show off by climbing dangerously on everything. Being a part of a community with kids who have such extreme medical needs isn’t something I dreamt about, but the moms of these kiddos are amazing and I’m so blessed to have them in my life. Today I met a caretaker of another child here for a BMT for a different condition. Everyone has a story and all involve heartbreak of some kind. I am so thankful for our days with Kiira and how it has opened my eyes to so much need in this world. We are so thankful for the prayers and support, the cards and messages we’ve received. Thank you for helping to meet our needs! 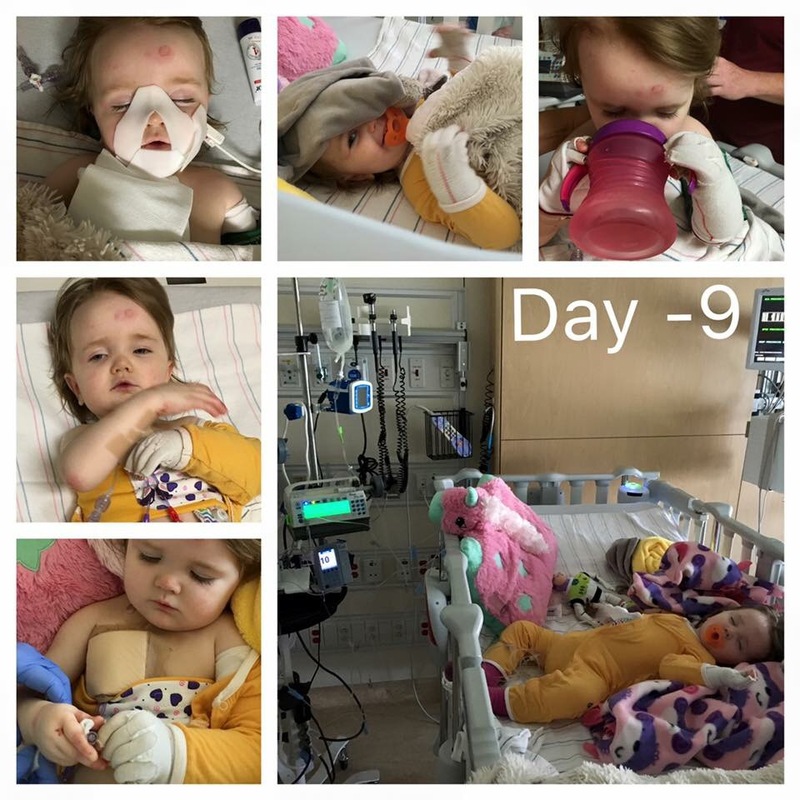 Day -8: All has been going great until a slight fever this evening. We know it’s not a big deal–just a side effect of ATG to feel flu-like, but Kiira’s high energy took a turn at dinner time. She is still so cute and sweet, but very subdued. I even got to rock her like a baby for awhile. 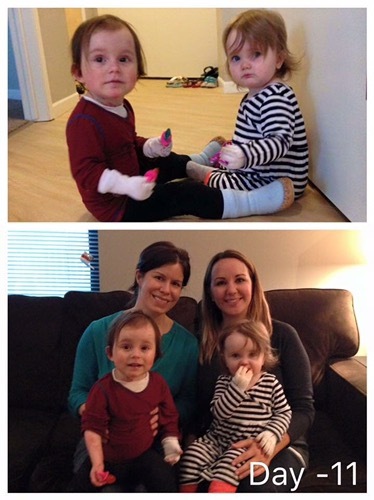 Kiira’s sisters visited today, which was a huge help. Kiira loved the company and we loved the entertainment for her. Plus, she got to be off her IV for a few hours so she could roam around the room free of her lines and practice her yoga moves. We know feeling crummy is a part of this process, but we hope it’s short-lived and not severe. Some of you have asked about sending things to Kiira. You can message me for her address. One benefit to being in Minnesota is that we get bandages covered so we are taking advantage of that. She doesn’t NEED anything, but some have asked, and she will love it. Thank you! 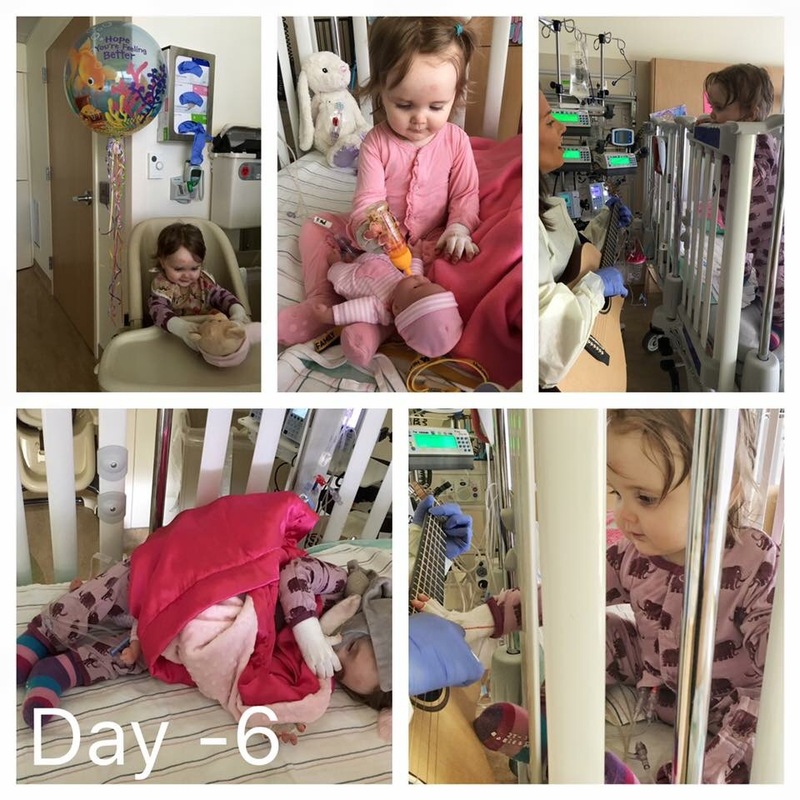 Day -9: Today Kiira went in the OR again to fix her central line. Everything went well and Kiira was so loopy afterward. They let us do her bandages while she was still sedated so that was nice. She was half asleep but wanted water so we sat her up to drink but she kept her eyes closed. 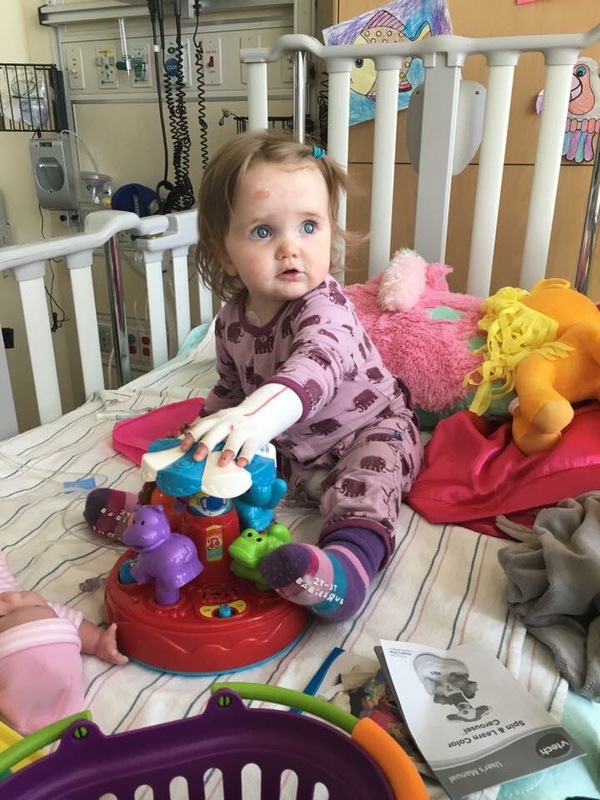 After she came back to normal, she wanted to help the nurse with cleaning her lines, just as she wants to help with bandages, put the pulse ox on her ear, or blood pressure cuff on her leg. She tried putting the thermometer in her tummy but we convinced her to take Buzz’s temp instead. Keeping her involved with her treatment is a good distraction so far. Kiira started with ATG today, an immunotherapy drug that is similar to chemo but has more immediate side effects. So far she is doing well though–she slept through half of it. Tonight Jason is on shift, so I’m hoping they get a restful night of sleep. It’s hard to believe we are really doing this again, but I’m relieved that, after all the planning and worry about getting to this point, we are finally here. Please pray for strength for all of us and success of this bone marrow transplant. Thank you! Day -10: Today is admission day! Day -11: Today was our last day all together until November. 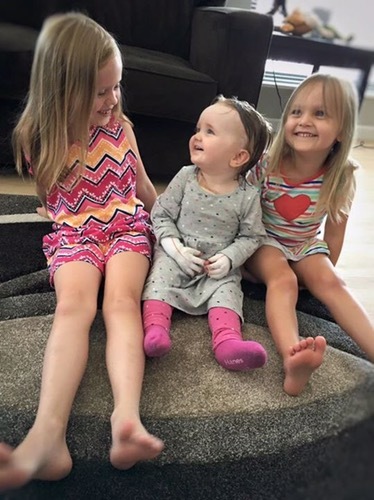 Kiira gets admitted tomorrow, so we spent the morning with Jenna, a happy, sweet girl who also has EB, and her wonderful mother, Adriana, and sister. They brought the girls some fun toys and treats and I think all the kids were happy to have someone to play with besides themselves. Thank you! Later, we took an outing and enjoyed the time together as a family. 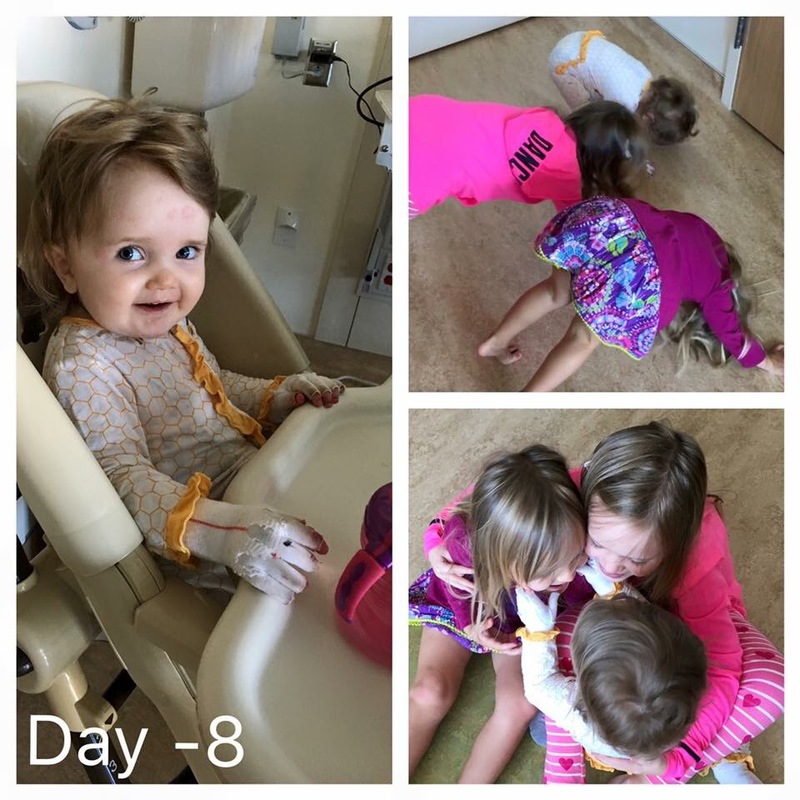 Yesterday Kiira had an IVIG infusion to replace her low antibodies. 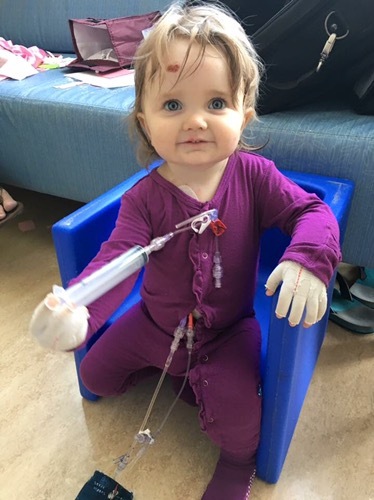 It’s usually so much easier with the central line, but we discovered an issue with the line, so it has to get fixed or replaced in the OR early Monday morning, which means Kiira gets put under again. They are not delaying chemo though, so we will get her first dose at midnight tomorrow. It’s surreal. 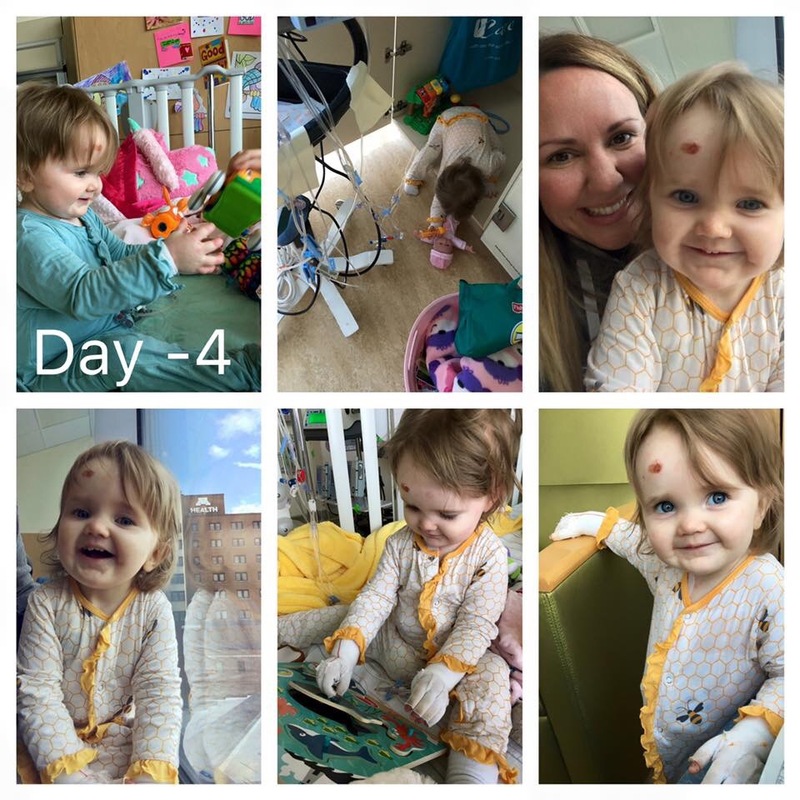 I just try not to think about it–to think about how sick Kiira will be, or she’ll lose her hair again, or all the risks of a BMT. But we can’t do nothing. I shouldn’t have to decide between letting EB run its course or put Kiira through a BMT to help stop the progression, but we did decide and I pray, I plead with God to bring her through this successfully. Day -13: Today Kiira had a GFR test, which tests her kidney function. Although results are on the lower end of normal, all other tests looked great and we can proceed with transplant. We signed all the papers today and get admitted Sunday. While waiting between tests, we visited the new Quinn Seymour Chapel–it is such a beautiful space and it’s been amazing to see it go from a concept by a fellow EB family to a reality. Tonight we went to an event at the hospital and I was able to see some of the local families. It’s so nice to reconnect and know we have support nearby. The things this hospital is doing to advance science and research is remarkable, but even more, they put so much care and thought into making the kids’ comfortable during difficult times. Kiira was back to her fun, happy self today. I love how she rebounds so quickly and hope it’s true after chemo too. Thank you for your continued prayers!